Yet another male duo – this time from New York. Lonely Man is a mid paced beat ballad that I like a lot. Wailing vocals and good harmonies are matched by work of the musicians especially the horns which are well done. Love that swirling organ. The uptempo flip “Don’t Dish Out (More Than You Can Take)” shouldn’t be ignored either. A nice obscurity. UPDATE ~ Jeff Lemlich writes "Vick & John were Victor Kerr and John Robinson (before he was known as J.P. Robinson). Vick is J.P.'s nephew, and so is record producer George Kerr. This was post-Chanteers for J.P., and before his solo material. 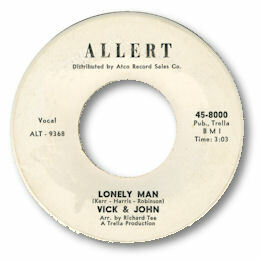 J.P. said the Vick & John record was around 1965. He also said he cut a demo 45 for George Kerr, "Just One Step Away From Losing Me", around the time when Kerr was hot with Linda Jones. He didn't recall it ever being released. J.P. and Victor cut this song up north, as you figured. In the late 70s, J.P. left South Florida and moved to New Jersey, where he went to work for the automotive industry. He quit the music business to feed his family. His last record (a 12") was for one of George Kerr's labels (keeping it in the family)." FURTHER UPDATE ~ Wash Lively has kindly written to remind me that Ady Corasdell included "Why Did She Lie" on Kent's "Carnival Northern Soul" CD, and according to his booklet, was unreleased but recorded at the same time as the two Allert tracks. The master tapes were in Joe Evans' (Carnival's owner) possession. Thanks to my friend Matt Starr for the tip and to Jeff Lemlich for the fascinating news about the real identity of the singers. I'm also grateful to Ady Croasdell and Wash Lively for extra info.